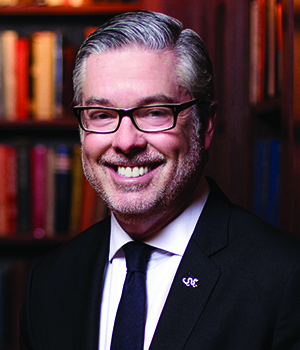 John Fry was appointed Drexel University’s 14th president in 2010, following eight years as president of Franklin & Marshall College. Previously, he served as executive vice president of the University of Pennsylvania. Fry immediately set out to transform Drexel into a private research university with a strong public purpose — an institution that harnesses both its long-established and growing strengths in cooperative education and translational research to serve students, its neighborhood, the city and nation. Under Fry’s leadership, Drexel is setting a new standard for online and hybrid education, public-private partnerships, and becoming a powerful force for economic development and inclusive growth in the Greater Philadelphia region. Fry has championed major neighborhood revitalization initiatives and secured development partners to build and manage non-academic infrastructure, attracting approximately $475 million in private investment in Philadelphia to allow the University to focus on making investments in its academic programs and research and teaching facilities. Meanwhile, Drexel has seen a significant increase in private philanthropy and corporate and foundation funding. As part of Drexel’s strategic plan to become an even greater economic engine for the region, Fry launched Drexel Ventures, a subsidiary enterprise to help faculty and students partner with the private sector to build businesses around their inventions. Those relationships will be at the heart of Schuylkill Yards, a $3 billion mixed-use development on University real estate adjacent to Philadelphia’s Amtrak 30th Street Station. In addition to leading Drexel, Fry assumed the chairmanship of the Chamber of Commerce for Greater Philadelphia in October 2016. A native of Brooklyn, N.Y., Fry graduated from Lafayette College and earned a master’s degree in business administration from the New York University Stern School of Business. He and his wife Cara have three children: Mia, a graduate of Williams College; Nat, a 2018 graduate of Drexel University; and Phoebe, a high school senior.